Exchange Online Protection (EOP) is a service which you can buy from Microsoft. They also offer a 1 month trial. You can use EOP with your on-premise Exchange as a mail gateway solution in and out. However, if you have Office 365 with Exchange Online, this uses EOP already. 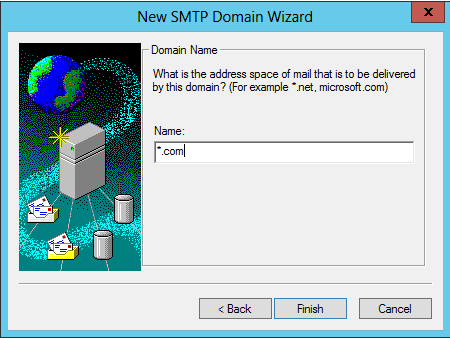 So you can make use of its features and relay mail through it using an IIS SMTP server. Why would you want to relay mail through EOP and not send directly? Because EOP ensures that everything is okay with outbound mail, ensuring mail is squeaky clean, keeping things top notch in relation to security. 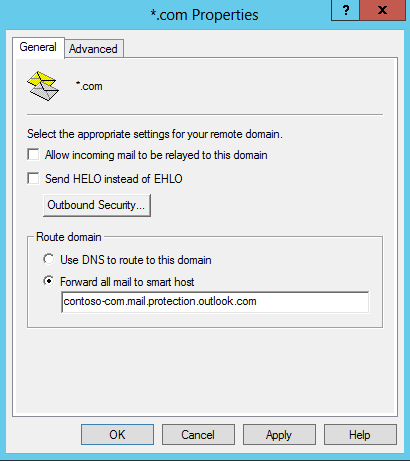 You can also relay mail from Office 365 itself, however this provides a major limitation, in that you can’t send mail from any domain you like, you can only relay mail from domains that have been setup as ‘accepted domains’ in your Office 365 tenant account. In other words, you need to prove ownership of the domains that you wish to send on behalf of. In contrast, EOP doesn’t care, you can send/relay mail from any domain you wish. But, don’t forget to add in an SPF TXT record in the domain’s DNS that you are sending on behalf of, to ensure that you are legitimately authorised. The steps I took here were based on a recent webcast done by Frank Brown of Microsoft listed here. If you download and look at the PowerPoint presentation, I am focusing on the last solution, solution number 3 in the slides. However I have added some more detail based on my experience. 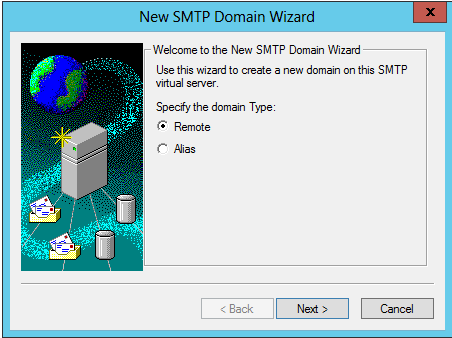 This server will be used as your IIS SMTP server, aka the SMTP relay server. For my example, I used a virtual machine hosted with Windows Azure. 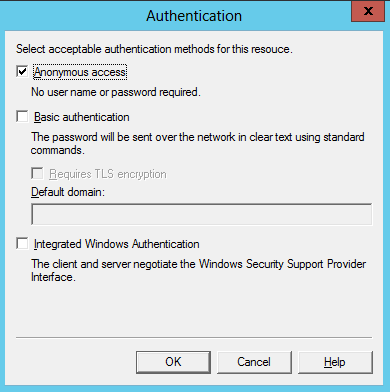 On your Windows Azure hosted SMTP server, you will need to install IIS SMTP. 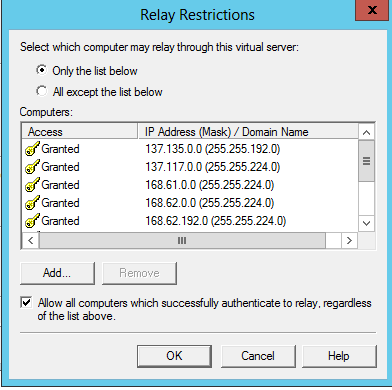 Some steps listed below are taken from here How to set up an SMTP relay in Office 365. 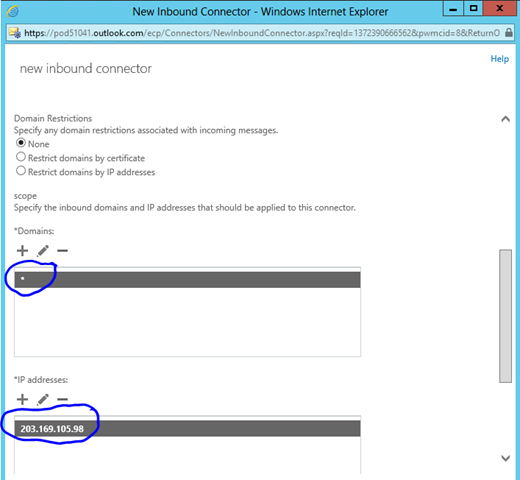 In your Windows Azure management portal, you need to allow for Port 25 inbound to your server. With Windows Azure, this is called an Endpoint. You’ll need to get the external IP address of your hosted server and create a DNS record both internally and externally which points to this IP address, or external DNS only if you don’t have an internal DNS infrastructure. 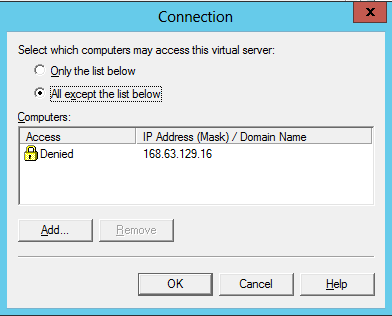 The external IP address of your VM can be found in the Windows Azure portal under the virtual machines dashboard. 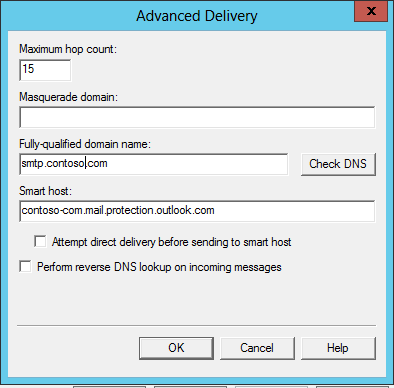 In this example, I will use smtp.contoso.com which will point to my allocated IP address. * What ever you do, don’t shutdown the virtual machine from the console. 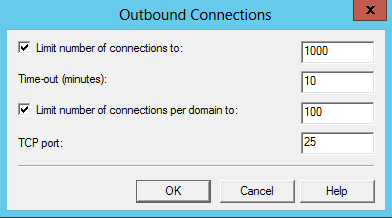 If you do, the VM will be de-allocated and once you power the VM back up, the VMs public IP address will change. On the Select Features page, select the SMTP Server check box. If you’re prompted, click Add Required Role Services. 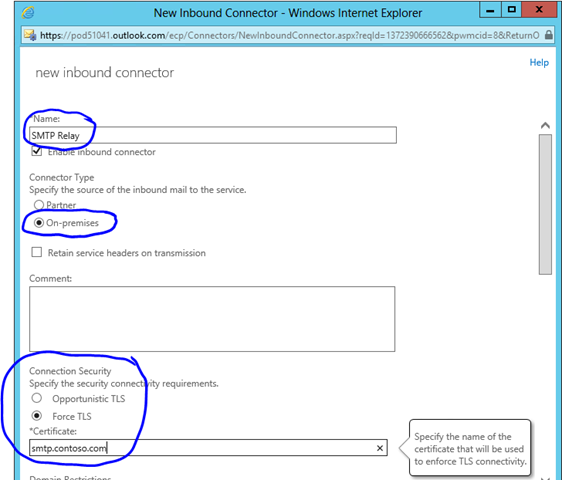 Note This step automatically installs all prerequisite roles and features, including IIS (if they’re not already installed). On the Access tab, click Connection, enter the IP addresses of the devices and servers that you want to be able to connect to the SMTP server. This is similar to relay, however one level above, it stops un-authorised connections before they attempt to relay. Click the Delivery tab, click Advanced, and then, under Smart host, enter the SMTP end-point for the tenant domain. This will be the same as your MX record. 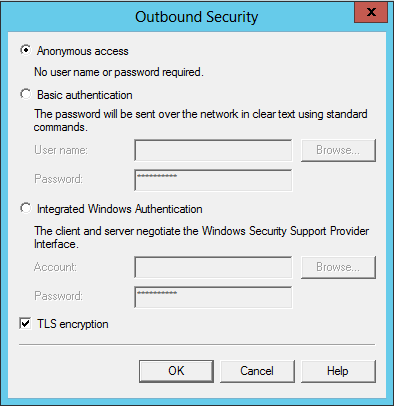 (i.e contoso-com.mail.protection.outlook.com). In the TCP Port box, type 25, and then click OK. Select Remote and click Next. Enter the name of the remote domain in which you want to send/relay to, click Finish. Right click on the domain you just created, then click Properties. On the General tab, enter the same smart host value as you did previously, then click OK.
Logon to your online tenant account http://portal.microsoftonline.com. Under the Admin menu at the top, select Exchange and then click on the Mail Flow link on the left. Click on Connectors, and click Add. Name: Choose a unique name for the Inbound connector. Under Domains, click the Add Icon. In the resulting Add domain window, enter * to apply the connector to all of your sending domains. Under IP addresses click the Add Icon, and in the resulting Add IP address window, add the external IP address of your IIS SMTP server. Populate this file with the following information, changing the CN to suit your own domain. Close and save the file. This will create a certificate request file for a single domain SSL certificate which you can use to generate a certificate with your favourite provider. We use Go Daddy. Once the certificate has been approved and generated, add this certificate to the local computer personal certificate store. Great walk through! Our company specializes in O365 Enterprise migrations and deployments, and its nice to be able to show this to their local IT on how the process works. The only thing that me and my colleagues disagree on however is creating a separate Inbound connector for SMTP relay. Why not just use the existing Hybrid connector that gets created? It already is bound to an SSL certificate and saves the headache AND the cost? Yes, good point, I guess I have always been the type to now mix things, like with servers, one server provides a single task. Some people like to have servers do many things. No right no wrong, its how I have always done things. Thanks for the very useful guide! I do have a question for you. In an MS presentation by engineer Frank Brown on this topic, he mentions updating your SPF record to include the public IP of the originating (relay) server. Your instructions do not mention that, so I am wondering if it will work without updating the SPF record because I have been unsuccessful in getting an on-prem relay to work and the only thing (as far as I can tell) I have not done is update the SPF record. Thanks! Adwords. Well I am adding this RSS to my email and could look out for much more of your respective interesting content.